My Former Work Spaces . . . I have since moved to a slightly larger house. It has one little bedroom for guitarmaking, another room for my computer, and a little workshed in the back yard. To see this "upgrade" in my work areas, click here. 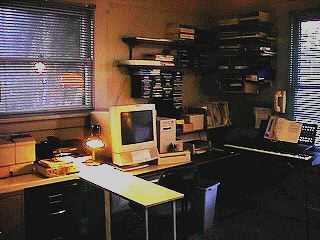 This was my main work table, in my spare bedroom/computer room. This is where I did my designing, marking, fitting, binding glue-ups, kerfing gluing, neck-fitting, fingerboard work, soundhole work, inlay work, etc. I had a small toolchest to the right of the table. The worktable hinged on the wall; I could hang the table on the wall, when I wanted to use the futon sofabed underneath the table. This is what the other half of my spare bedroom looked like -- it is where my computer (on which I created these web pages) sat. 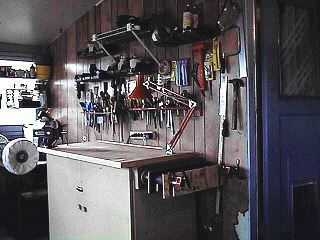 This is the workbench in my back utility/washer-dryer room. 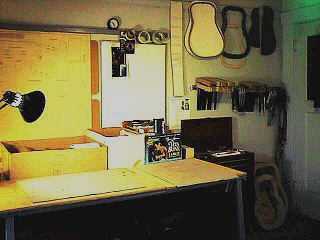 It is where I did all my binding routing, sanding, cutting, neck-carving, etc. 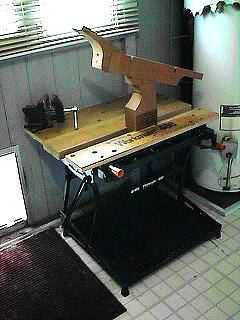 At the end of the bench is a guitar vise I made with pipe clamps and plywood jaws lined with carpet. 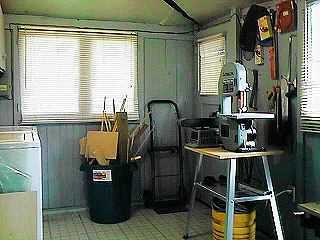 This is the side opposite the workbench, in my back utility/washer-dryer room. 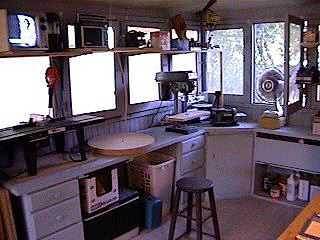 It is where I had my drill press, small belt/disc sander, fan, and (of course) radio and television. 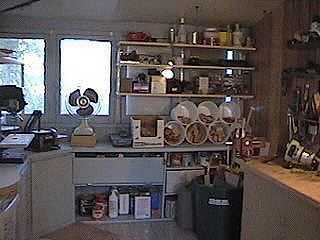 I built those shelves up above, to get the TV, radio, and whatnot up off the counter, thus freeing up working space. One suspended shelf also served as my "go-bar deck". This is something else I just did to revamp my little utility room. 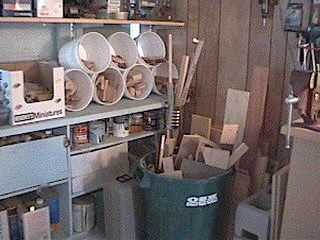 I replaced two narrow glass shelves with three wider pine shelves and added some 2-gallon pails for wood scrap storage. What to do with all those little scraps of wood you inevitably accumulate?????? I finally figured out a way to store and organize it all, in a minimum of space (which is my ever-present problem). Little scraps went in those plastic pails, long dowels stood upright through a coffee can screwed to the counter edge, large boards were propped up against the wall by a garbage can filled with other large scraps. This is my very handy WorkMate bench, with a neck-holding jig held in the vise. I also had an all-purpose vise attached to the WorkMate. I could hold the end of the neck in its suede-lined jaws, and lay the guitar body on the top of the WorkMate. This is my Delta 8" Benchtop bandsaw and 4" belt sander and disc sander -- in the half of my utility room that also housed my washer and dryer. Also, my very necessary shop vacuum.